I've seen J. M. DeMatteis's name a lot but I haven't read much of his work, and of that, most of it was "bwah-ha-ha" stuff co-written with Keith Giffen. To that end, I was a little nervous about his taking over Justice League Dark, which just finished a stellar third volume by Jeff Lemire and Ray Fawkes, and also what his scripts for Phantom Stranger, from plots by Dan DiDio, would look like. Having finished Trinity of Sin: The Phantom Stranger Vol. 2: Breach of Faith, I can rightfully say I've followed DeMatteis's creations to Hell and back ... and I'd do so again in an instant. 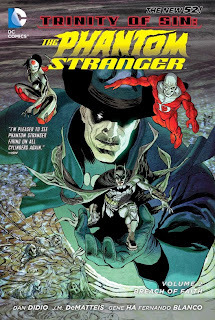 In the first volume of Phantom Stranger, DiDio posited this title as a bit like Quantum Leap or The Fugitive; in most of the issues the Stranger is sent, presumably by God, to push someone on to a certain path, and the Stranger is often responsible for betraying the person in the process. The second volume's structure is similar; the story finds the Stranger on a quest to find his missing adopted human family, but while there's more connection, the stories still feel self-contained and episodic. This is a boon, I think, as it gives the series an air of a horror serial like Tales from the Crypt or Twilight Zone. The book bobs and weaves a little bit, not immediately following up from the last volume's cliffhanger but rather sending the Stranger on a side trip to Las Vegas. From this first issue, DeMatteis immediately impresses; the Stranger joins a poker game with three of Trigon's sons, and the copious, winding dialogue is something to behold. The intricate poker game scene is itself over ten pages long, and in the entirely of the issue there's nary a punch thrown, something all too rare in today's superhero comics. DeMatteis delivers in a Phantom Stranger comic exactly what you would want -- tales of supernatural intrigue markedly different from your average Superman or Batman comic. Gene Ha's boisterous, rounded shapes are perfect for the issue. Breach gets even more engaging, however, the deeper the reader goes. This volume finally reveals how the Phantom Stranger came to have a human persona, Phillip Stark, and a human family. The truth is certainly horrific, a little better and a little worse than the reader might have imagined. What comes out of this most notably is that the original Stark, a murderer killed by the Stranger, has now become the demonic Sin Eater, giving this series the Stranger's first original nemesis. DeMatteis does well here in that despite that Stark is a serial killer and the Stranger's actions might be generally considered "right," the series never quite gives the Stranger that break, always suggesting that he, too, transgressed by interrupting the destinies of Stark and his family. DeMatteis then follows in the grand tradition of comics horror titles like Alan Moore's Swamp Thing and Neil Gaiman's Sandman by sending the Stranger to both Hell and to Heaven. What he encounters in both places is, again, horrific, and wrenching; the eternal torments that the Stranger might face in Hell pale, to an extent, in comparison to the choice he must make in Heaven of resurrecting just one of his three deceased family members. Dematteis and DiDio have brought the Stranger full circle from the beginning of the book, now understanding the relative fruitlessness of trying to shrug the yoke that God has put on him; I'll be curious to see for how long the Stranger is a "good soldier" and how he might inevitably act out next. Constant readers will forgive me, but I actually didn't read the last issue collected in this volume, a Trinity War tie-in that seemed to me, when I glanced at it, to start in medias res. Ordinarily I read straight through books, crossovers irrespective, so I can review here whether the tie-ins made sense or not. However, the Trinity War tie-in issues collected in Justice League of America Vol. 1: World's Most Dangerous made so little sense out of context, and given that I have an opportunity to read the single Trinity War collection, I've decided to treat myself this time, not read Trinity War piecemeal, and instead read it in its intended reading order. Possibly I'll report back here later how much sense that final Phantom Stranger Trinity War tie-in issue makes on its own; my initial guess is not much. That said, constant readers may begin to sense a bit of a trend in recent and upcoming reviews -- Justice League Dark, Phantom Stranger, and next a bit of Aquaman and Justice League -- because, yup, we're on the road to Trinity War. As for this volume, I never thought I'd consider myself a Phantom Stranger fan, but with Trinity of Sin: The Phantom Stranger Vol. 2: Breach of Faith, J. M. DeMatteis has made me a believer both in the Stranger and in himself. This one was a pleasant surprise, and I'm equally surprised how excited I am for volume three. Like you, I've also read J. M. DeMatteis Justice League and that's pretty much it. I'd like to check this out if only for Gene Ha's amazing art. Ha's art doesn't always appeal to me -- I thought the difference was too great between Ha and Jim Lee in Justice League #7 -- but Phantom Stranger was a perfect fit for him. The "poker game" issue is gorgeous.